To explore Facebook organic marketing, I interview Mari Smith. Mari is a consultant for Facebook and the leading expert on Facebook marketing. She’s also author of The New Relationship Marketing: How to Build a Large, Loyal, Profitable Network Using the Social Web. Mari has a loyal tribe of marketers she trains and communicates with, and she says there’s a love-hate relationship for many marketers who utilize Facebook and its family of apps. Even though she’s an expert, she can relate. 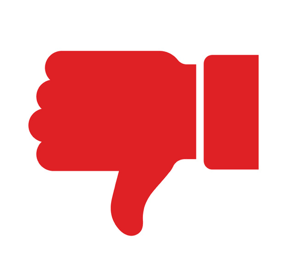 There are arenas of Facebook marketing that are terribly frustrating. The things that used to work don’t any longer—one of which is certainly organic marketing—and the frequency of change is frustrating for business owners. That said, Facebook is still the primary channel for many marketers. I note that even with the recent privacy-related scandals, people who say they likely wouldn’t be on the platform each day if their work didn’t require it also say they probably couldn’t step completely away from it either. I liken the platform to a Siren, and Mari agrees. There are changes to the algorithm to consider in addition to the type of content that Facebook chooses to give preference to at any given time. Facebook features aren’t the only things that have seen change, though. For the longest time, Facebook’s mission statement was to connect the world. Then, out of the blue, they decided to change it. Now the mission centers on giving people the power to build community and bringing the world closer together. For example, Facebook began putting on live, in-person Facebook Communities Summit events, and participants are chosen from applicants who manage major Facebook groups. Mari believes this a cue that Facebook is working toward making the Groups product more business-friendly. She points to new monetization features such as subscription groups as a byproduct of that business-friendly agenda. She thinks this relates to something Mark Zuckerberg said on the Q4 earnings call in January. He said that people want to share in more private environments. Those environments certainly include groups, but also extend to messaging and other products that support ephemeral content, such as Stories. Additionally, due in part to all of the legalities around the platform’s data protection issues, Facebook is putting a strong emphasis on making more of their products with end-to-end encryption by default. The notion that our information is encrypted and doesn’t stick around forever is supposed to appease the general public. What does this mean for marketers? Mari believes people will be much more open about sharing personal things when they think the content is going to disappear. She also surmises that Facebook is gathering some of that data, all anonymized, and that even though Stories content disappears, it’s somehow going to be targetable. Listen to the show to hear my observations on link posts from inside groups. Mari thinks the question posts work for two reasons. First, they take up less space in the news feed. News feed space is especially important when you remember that 90% of Facebook users access the platform predominantly via mobile devices. Second, a question hooks the mind. And if it’s a well-crafted short question, our brains almost can’t help but respond, and Facebook wants the content in the news feed to elicit meaningful interaction. They want people to hit that Comment button, not just tap a reaction button, and leave five words or more. Video is working because Facebook has their eye on the slow migration of television viewers, and by extension, the advertisers who’ll eventually follow those viewers. For many years now, Facebook has been very determined to be a major player in the digital-streaming arena. They’ve had some missteps because they’re literally trying to train users who aren’t used to thinking of Facebook as a destination video platform. Facebook is having to iterate and reiterate as they try to work with content producers on one level, and work with how users respond to content and video products on another level. Additionally, Facebook has run out of real estate in the news feed and video provides another opportunity for ad placement via ad breaks, which is a new placement for ad video. The bar for ad breaks is set quite high for now, but Mari is hopeful that small business owners will soon be able to take advantage of this new placement. Then there’s the new Showcase for Premium Video Advertisers. On the Facebook Watch platform, high-end shows such as Red Table Talk, Ball in the Family, Queen America, Sorry For Your Loss, and Recipes are getting millions of views. THE MOST AMAZING LASAGNA may very well be the world’s best lasagna. And that pasta hack? Genius! Facebook sees this as another opportunity to monetize a small number of video shows that have millions of views, and they’re offering advertisers the ability to place ads in this exclusive content. Listen to the show to learn how Facebook is training creators to build content around ad breaks. Mari has four categories of videos she says are working for her, her audience, and her clients. 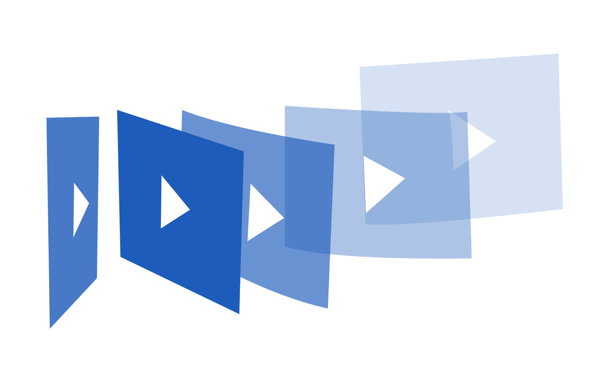 You can use these 15-second videos to drive traffic to your blog posts. Start with the title of the post, pull out one or two key points, include some moving images (stock footage or your own footage), and use some text overlay so people can watch with the sound off. Then add the blog post link in the first comment or put it above the fold. VIDEO Posts Get the Most Engagement on Facebook! Our friends at BuzzSumo analyzed 777 million Facebook posts to find the most engaging pages, brands, and videos for 2018. The MOST engaging type of Facebook posts in 2018 was VIDEO! 📺🙋🏼‍♀️Woohoo! A valuable trick is to put just a small amount of budget on the post via a boost so you get access to creating a clickable link that stays even after the ad is expired. I share that we’ve been experimenting with square, captioned video that’s longer than 15 seconds but shorter than 60 seconds (usually about 45 seconds long), and we’ve been getting a really good retention rate. Long-form video can be 3 or more minutes, but BuzzSumo’s research found that 3–5 minutes is optimal and gets the best reach and engagement. This type of video could feature you talking and teaching the viewer something or sharing a quick tip. Mari’s Live videos tend to run anywhere from 20 to 60 minutes long. She was blown away when a separate BuzzSumo study revealed the optimal length for a Facebook Live is between 3 and 4 minutes. While Mari and I both agree that live video is the thing most likely to meet Facebook’s meaningful interactions bar, we also struggle with meeting that bar in 4 minutes, especially when truly engaging with people. Mari says that engagement is the secret. 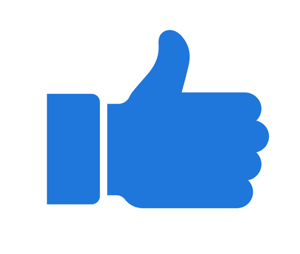 If your audience is engaging with you for 4 minutes, Facebook will let you continue to broadcast. If you’re a marketer who’s really not done much with live video yet, you could create a series of 10-minute videos to break down some teaching points by consistently going live once or twice a week. As your audience starts to engage with that content, you can experiment with longer broadcasts as long as you retain engagement. If you’ve got a weekly show, keep it somewhere between 18 and 22 minutes; our brains have been trained for decades that this is an average episode length. This type of video can be very expensive to produce, and if you’re not somebody famous with a big PR engine behind you, it can be difficult to get people to watch this type of content. That said, Facebook is really pushing this type of video content as much as possible so they can monetize it and bring in more advertisers. Listen to the show to hear Mari and Mike speculate on what’s coming with Stories. Mari believes Groups is a growing arena, and she highly recommends that businesses create at least one group that’s linked to their Facebook page. A software company could have a study group or a user group. A membership organization could have a paid group and use the Subscription feature to collect the money. The Boost button and more great features are rolling out to Groups soon, and Facebook is really trying to make sure groups are an integral part of your marketing. Podchaser is a handy tool that lets creators showcase their podcast appearances. It also lets others browse a directory of all of the podcasts someone has published and been a guest on. 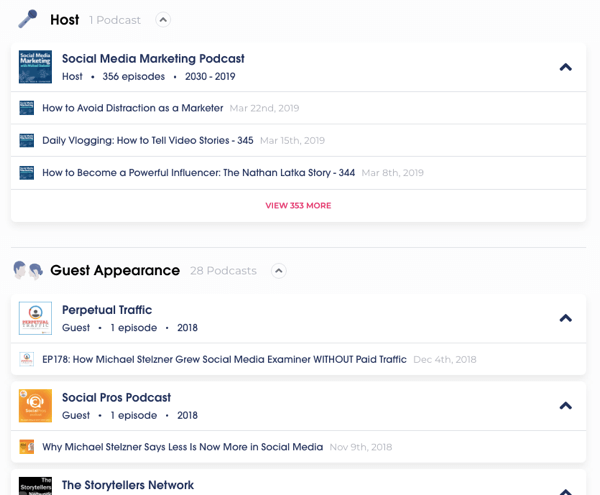 To illustrate, if you look up Michael Stelzner, you’ll see a list of all of the Social Media Marketing podcast episodes he’s hosted, and under that, you’ll see a list of all of the episodes of other podcasts on which he’s been a guest. Additionally, people can filter podcast show episodes by topic to create a curated playlist of all episodes that pertain to that topic. Podchaser is currently in beta and is free for all users. Listen to the show to learn more and let us know how Podchaser works for you. Visit Mari Smith’s website and check out her Facebook page. Read The New Relationship Marketing: How to Build a Large, Loyal, Profitable Network Using the Social Web. Explore Facebook’s Communities Summit events and Showcase Videos for Premium Advertisers. Read BuzzSumo’s research on post engagement. Read Mari’s article about optimizing Facebook Live. What do you think? 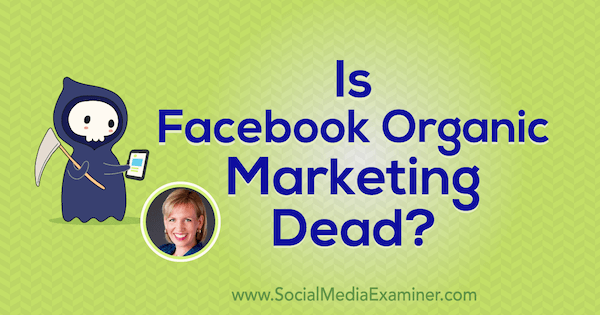 What are your thoughts on the future of organic Facebook marketing? Please share your comments below.